MIRPUR, Bangladesh – Dwayne Bravo rocked the top order while Sunil Narine carved through the middle as defending World T20 champions West Indies humbled Sri Lanka by 33 runs in a warm-up match at Shere Bangla National Stadium, Mirpur here on Wednesday. Narine grabbed four wickets to bury ambitions of recovery after Sri Lanka, Chasing 173, were reduced to 18 for two in the fourth over until Tillakaratne Dilshan and Kumar Sangakkara attempted to rescue them with a 54 run third wicket stand that brought some stability to the scoring. Opener Kusal Perera was dismissed cheaply by Samuel Badree and Mahela Jayawardene was sent back for a first-ball duck by Ravi Rampaul but Dilshan and Sangakkara repaired the damaged to some extent before the beaten finalist in the 2012 tournament stumbled again. Bravo picked up three wickets including uprooting the stumps of opener Dilshan with a top score of 43 and Sangakkara. Dilshan scored 43 off 36 balls, with six fours, while Sangakkara added 24 runs off 19 balls, with three fours, as the two brought the match to a crucial stage before Narine wreaked further havoc as Sri Lanka were bowled out for 139. Bravo finished with figures of three for 29 while Narine topped the bowling with four for 24 including the scalps of Dinesh Chandimal (14) and Angelo Mathews (18) off successive balls. However he could not complete his hat-trick because of a no-ball. Earlier, Dwayne Smith gave the West Indies a flying start by powering his way to a top score of 60 after Sri Lanka had won the toss and elected to field first. Smith who cracked eight fours and two sixes compiled a quick fire 47 with Chris Gayle who was the first to go for 12 in the sixth over. West Indies were at one stage reduced to 55 for two as Andre Fletcher went for 8 but a third wicket partnership between Smith and Bravo brought the Caribbean cricketers back on course. 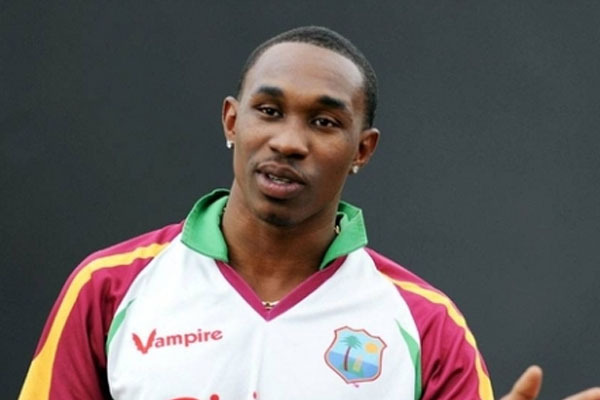 Bravo scored 43 runs off just 31 balls but the Windies lost momentum when Lendl Simmons fell for ten. However Skipper Darren Sammy came to the crease and blasted 30 runs off 14 balls, including one four and two sixes, to take the score to 172 for five. On Tuesday, West Indies crushed England in their first official warm-up match of the World T20 tournament. West Indies Innings: 172/5 (20 Overs). Dwayne Smith 60, Dwayne Bravo 43, Darren Sammy* 30*, Chris Gayle 12; Rangana Herath 4-0-20-2, Seekkuge Prasanna 3-0-14-1, Suranga Lakmal 2.2-0-16-1, Ajantha Mendis 3-0-43-1. Sri Lanka Innings: 139 All Out (19.2 Overs). Tillakaratne Dilshan 43, Kumar Sangakkara+ 24, Angelo Matthews 18, Lahiru Thirimanne 14; Sunil Narine 4-0-24-4, Dwayne Bravo 3.2-0-29-3, R Rampaul 2-0-11-1, S Badree 4-0-30-1.